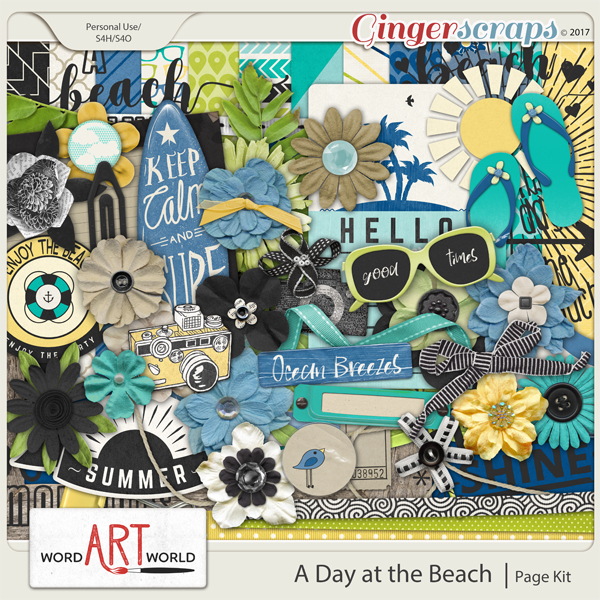 Word Art World has an ocean-friendly digital scrapbooking page kit for the Gingerscraps Buffet this month. It is filled with all kinds of summer goodies. And, for a limited time only, you can grab this entire kit for only $2 or the elements and papers separately for $1 each. I don’t have very many beachy photos that are unscrapped, so I dug into my old photo collection and found this gem of my great-grandparents and my Uncle Adolf. Word Art World’s latest kit is too adorable. Baby Girl is perfect to scrap those precious baby photos. I had such fun looking through Jessica’s baby photos to find some photos I wanted to scrap. Word Art World has a very sweet contribution for Gingerscraps’ April Buffet. Cherished is perfect for memories all your loved ones. I already had pictures from a visit to El Paso open scrapping some fun we had at Wyler Aerial Tramway. I decided to scrap photos from the other part of that trip visiting with Granny Moore and Uncle Butch using Cherished. I love being on the creative team for Word Art World, because Jennifer always comes up with the best word art. Us is no exception. You can purchase it at Gingerscraps or The Digi Chick. In my last post, I mentioned I had another layout using Southwest Sunsets. This is it. I really love this pic of James and I. It’s kind of crazy to think it was taken almost 13 years ago.